Order a Bench for your Boat! To order, a 50% deposit must be made to "Lowcountry Monuments". An invoice will be forwarded for payment. Check or Credit Card is accepted. Final Payment of the remaining balance is due upon installation - again an invoice will be forwarded. Rusty Pickett was the Executive Director of the former Cold War Submarine Memorial Foundation - responsible for building the Memorial. Do NOT contact Patriots Point, as they are not involved with bench ordering or installation. All the benches are the same. No deviations will be allowed. This was the decision of the Foundation Board upon dedication. We are using the latest monument technology to fabricate the benches, hence the ability to make color ship's patches. 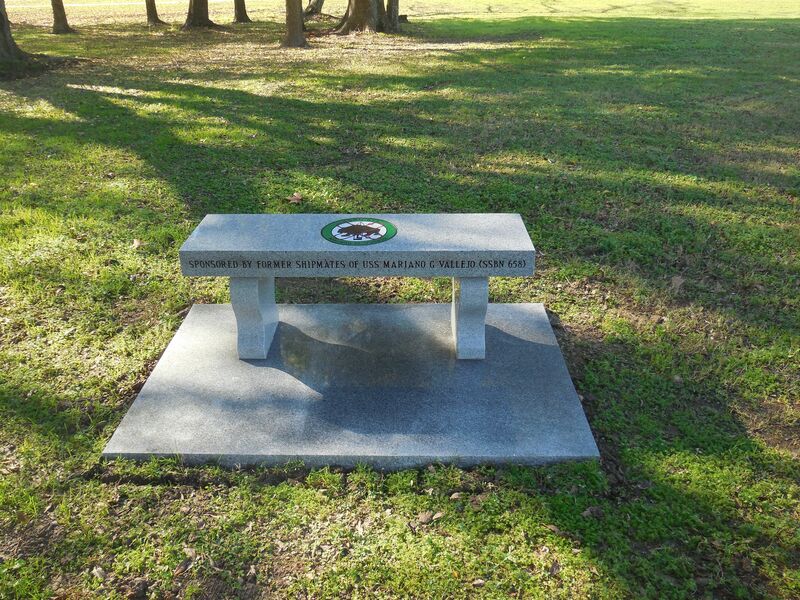 The benches will look like this: (Ship's patch on top; "SPONSORED BY FORMER SHIPMATE of USS...." on the front). Benches take about 3 - 4 months to fabricate, and production time is based on when the quarry cuts stone of this size. When ready to install, Rusty Pickett will contact the appropriate bench purchaser to arrange a mutually convenient time for installation. Any and all shipmates and friends are invited. The assembled group of shipmates decides on the location in real time, with the final say with Rusty Pickett, per agreement with Patriots Point. With many years of experience, fundraising is quick as long as you can get in touch with shipmates. If the collection happens during a ship reunion, the cost can be raised in under a day! Other associations that were intstrumental in supporting the Submarine Force during the Cold War may order benches. The format of the bench will be similar. Rusty Pickett will have the final say on whether the bench is appropriate for the Memorial.